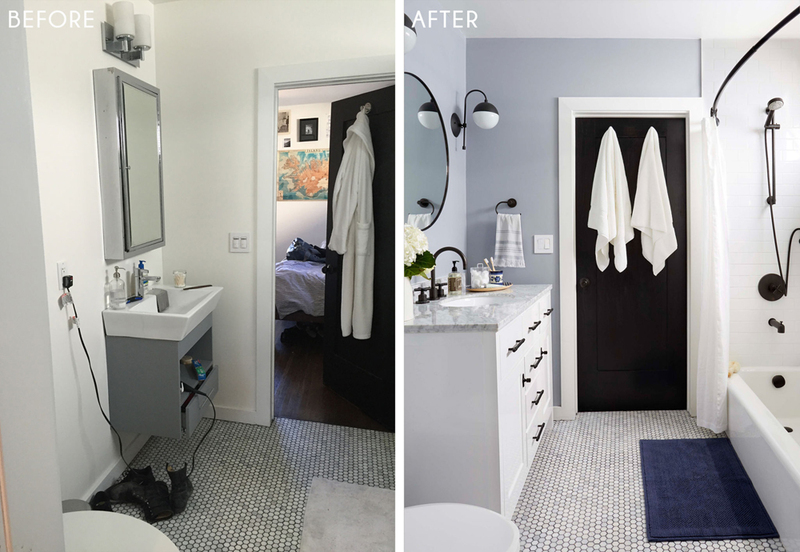 Hey all it’s Ginny here with a quick bathroom refresh makeover. 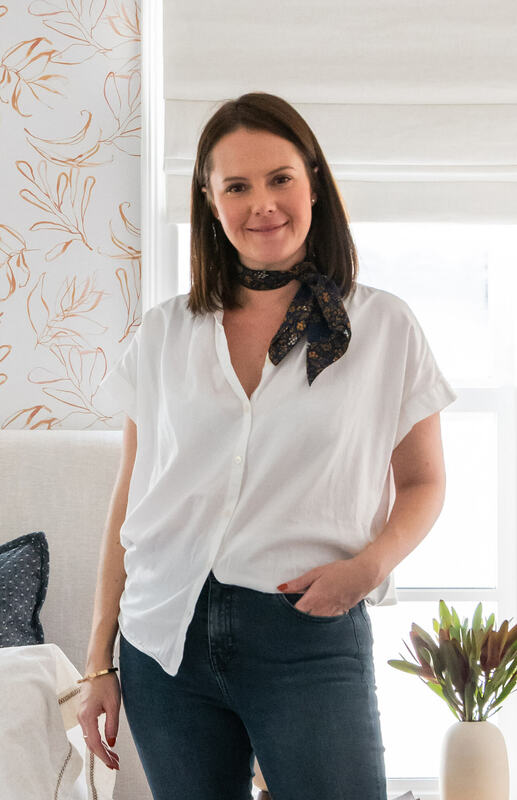 This is at the same house we did the traditional eclectic kitchen remodel and we’re currently helping with some updates on the open plan living and dining room so we’ll be sharing that soon on the blog, but today we are walking you through what we did to the bathroom. This room is their guest bathroom/powder room which is located between the laundry/kitchen and the guest bedroom (which has now become the nursery). There was a lot of unused space in there that we wanted to maximize, so we started by adding a larger vanity that had more storage and worked better to fill the space functionally. The bathtub was also really big and the client didn’t need for it to be quite that large so we decided to swap it out for a smaller tub and add a full height linen closet next to it. By doing that, it meant that we had to move the window, which to some people might seem crazy and an added expense but was achievable in the overall budget. 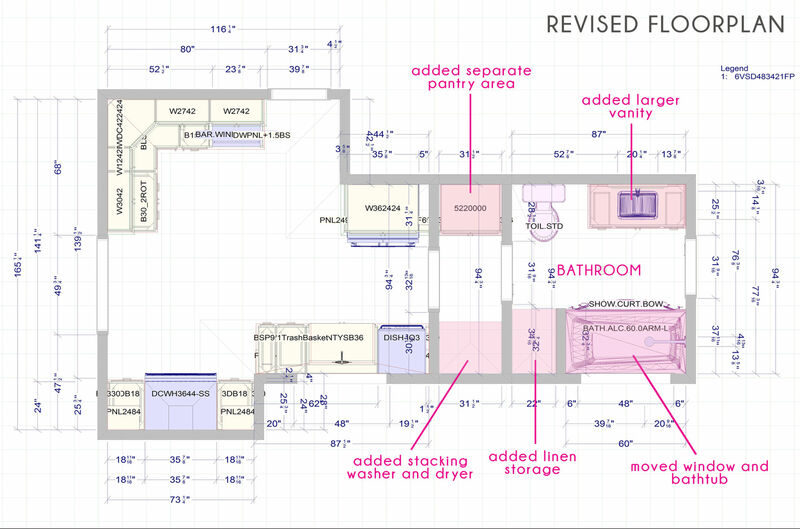 You can see it a little bit more clearly in the floor plan below where we have highlighted what we changed. Speaking of budgets, I know a lot of people are really intrigued as to how much things cost so I’ll try to break this project down a bit. The client wanted to spend between $50 – $75k for the entire renovation which included the full kitchen remodel, the bathroom remodel, painting the entire interior of the house including ceilings, trims and doors, adding new lighting throughout, installing new AC grills, adding a new window to the nursery, building a new bookcase in the living room as well as a few other small bits of things like patching up a random dog door. 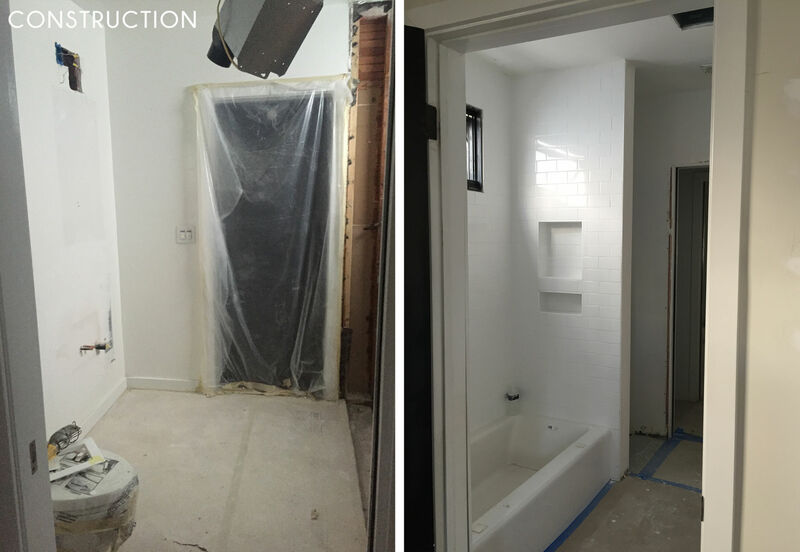 In some cases, the clients like us to take on all of the budgeting, however with this project the client dealt directly with the contractor. So while the budget was set between 50-75k I don’t know exactly what the overall renovation ended up costing but including the materials it was on the upper end of that range. Considering the amount of work involved, that really isn’t a bad price, but I will note that we didn’t swap out the floors in either the kitchen or bathroom and we kept the existing kitchen appliances which saved us a ton of money. 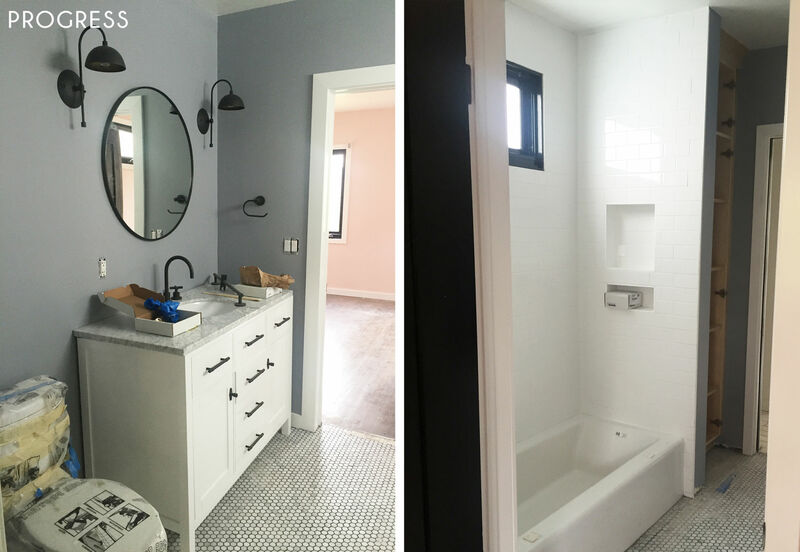 You can see in the above and then below where we added the little nook to create the full length storage area adjacent to the bathtub and how it was built out with custom cabinetry to suit their needs. And here is the finished room! We kept with the black and white vibe mixed with cararra marble so that way it flowed in from the kitchen well. To save money we opted for a pre-made vanity with a cararra marble top and swapped out the hardware for something a little nicer. Considering this was bought online,the vanity is actually pretty great,the lines are simple with the shaker fronts and has a ton of storage and fills the space really well. 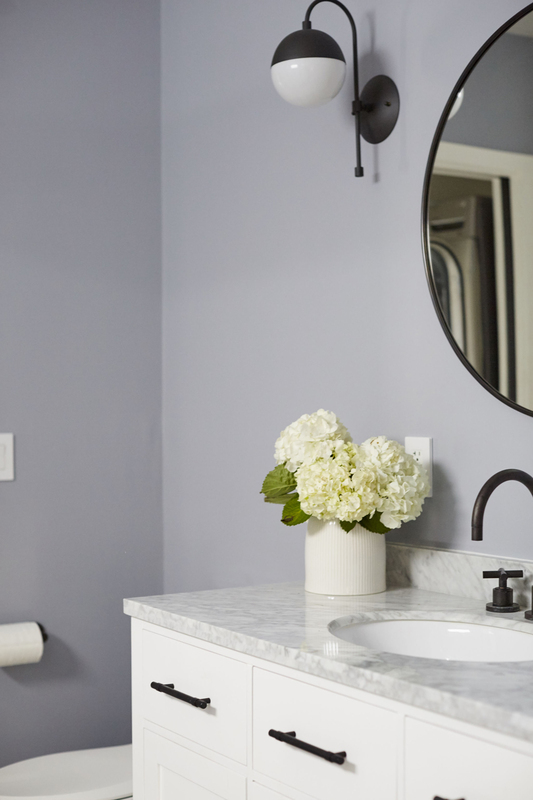 We got all the plumbing fixtures from Pirch which made the process easier and faster. 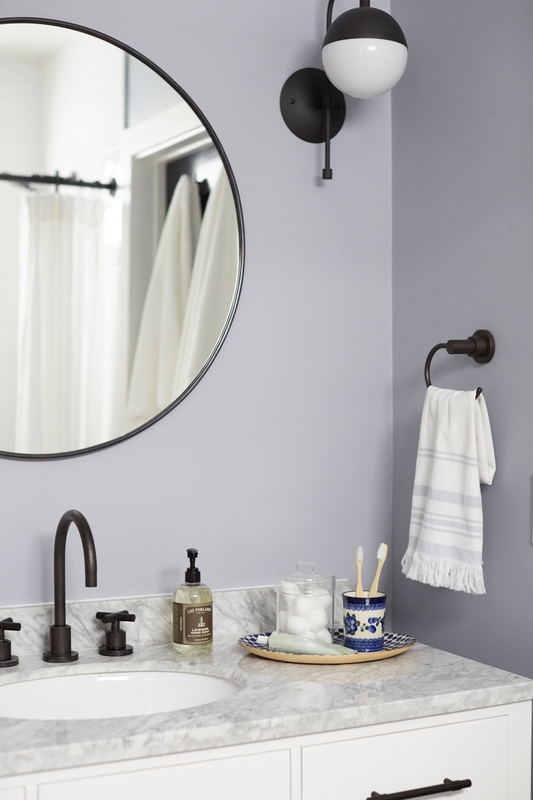 The round mirror,sconces and hardware are from our friends at Rejuvenation. 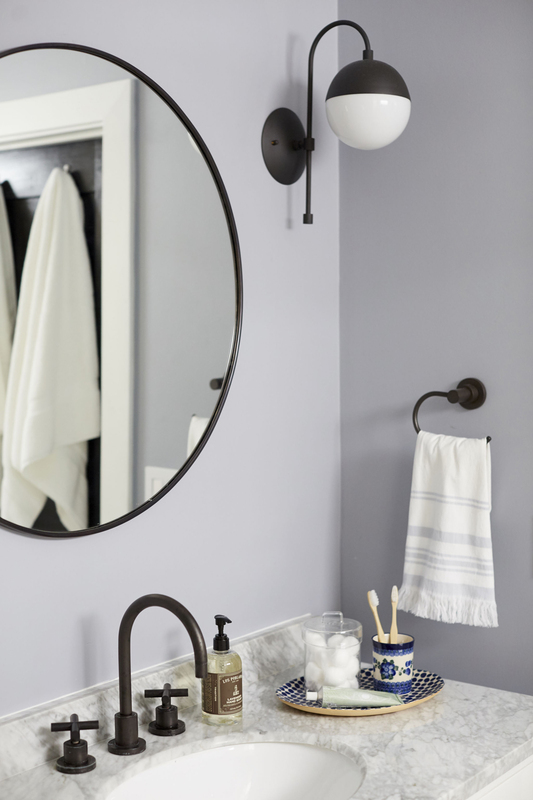 I liked the idea of bringing in a round mirror to soften up that corner and it works well with the cute sconces. I actually just realized that we finished this project a year ago which is crazy and we’re only now just blogging about it. As always we styled it for everyday use by corralling items onto a tray like a toothpaste cup, cotton balls in a neat glass canister and a tube of toothpaste. Items like this are always nicer when they are grouped together on a platform of some sort and that way they’re not feeling scattered around. Since the soap is on it’s lonesome this is ok to be sat closer to the faucet. This room is pretty tricky to photograph so unfortunately you don’t get really get to see the full pulled back view of where we added the linen closet. But you can kinda see it peeking through there. 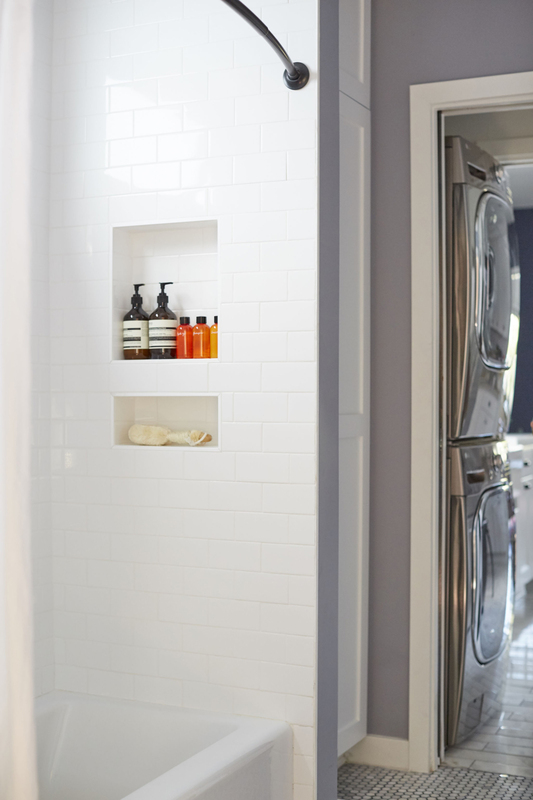 It really did help to transform the space and means they now have a lot more storage in there for towels. 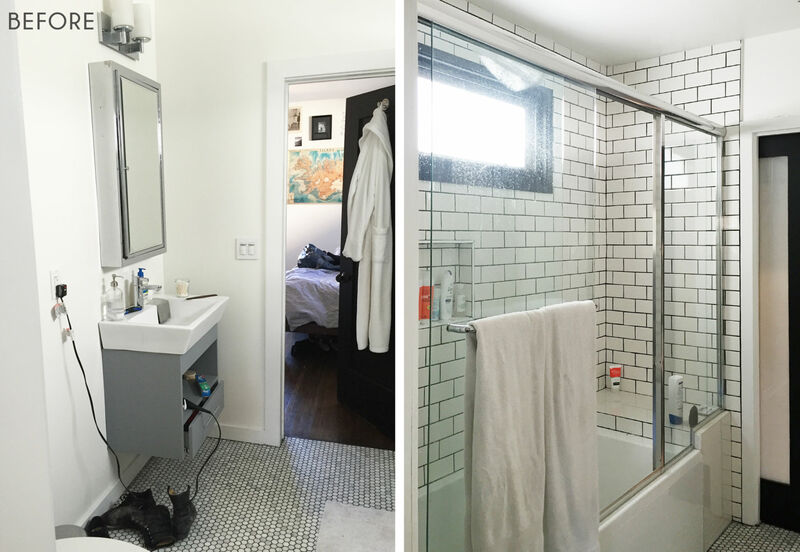 We retiled around the bathtub with a simple subway and white grout to keep it feeling clean. I’m now wondering why I used those crazy bright orange bottles to style with … ah you live and learn right?! 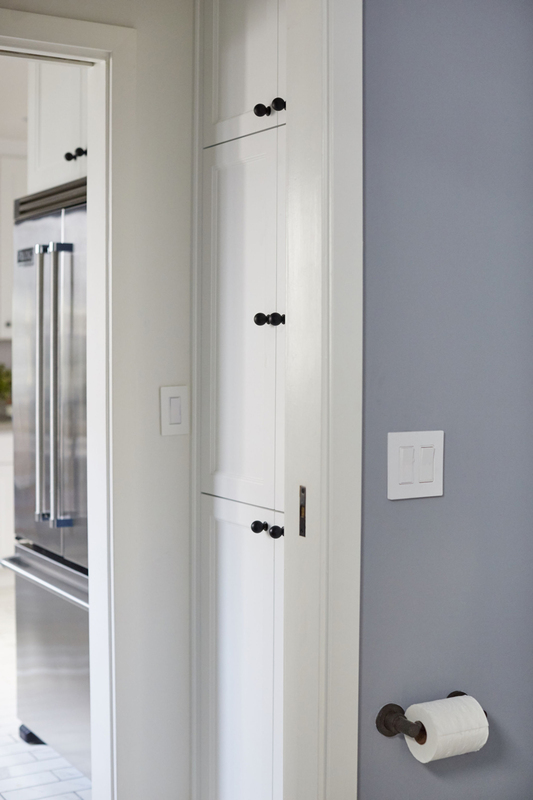 To add a little hint of colour we painted out the walls in Sweatshirt Gray from Benjamin Moore. It’s a blue grey that has a little hint of purple in there which makes it feel warm and inviting in there. 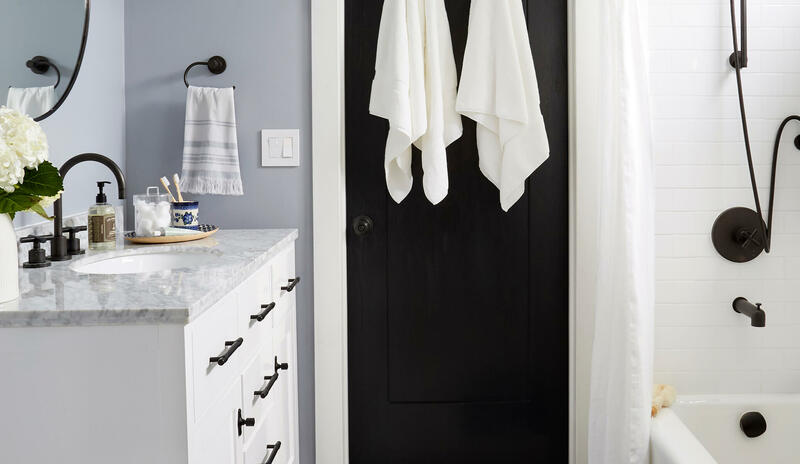 The door between the bathroom and the laundry/kitchen is a pocket door which is ideal for the tight space. 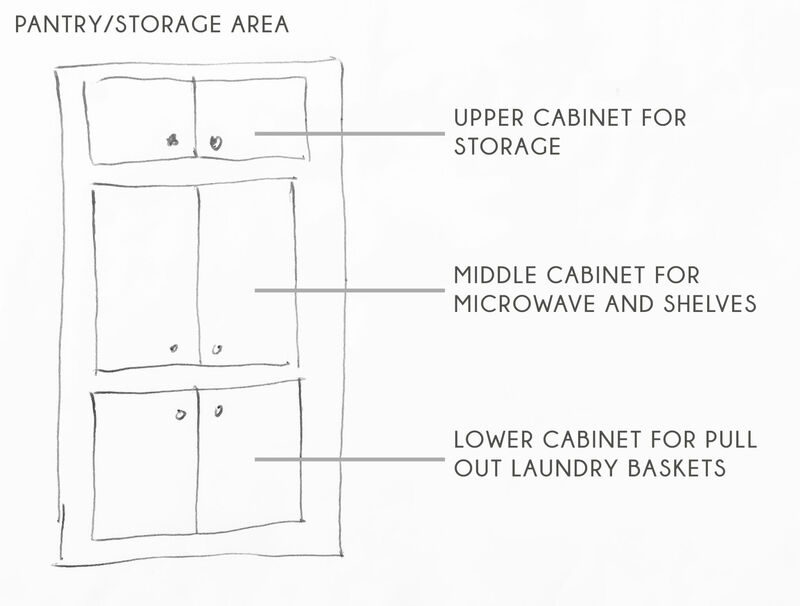 You can see the pantry/laundry cabinet which we custom designed to have pull out laundry baskets at the bottom, an appliance station in the middle and then additional storage at the top. There wasn’t really any other space for either the laundry baskets or coffee maker (since the client wanted to hide them away), so we combined it into one space which can be closed off from the kitchen when the washer/dryer is in use. 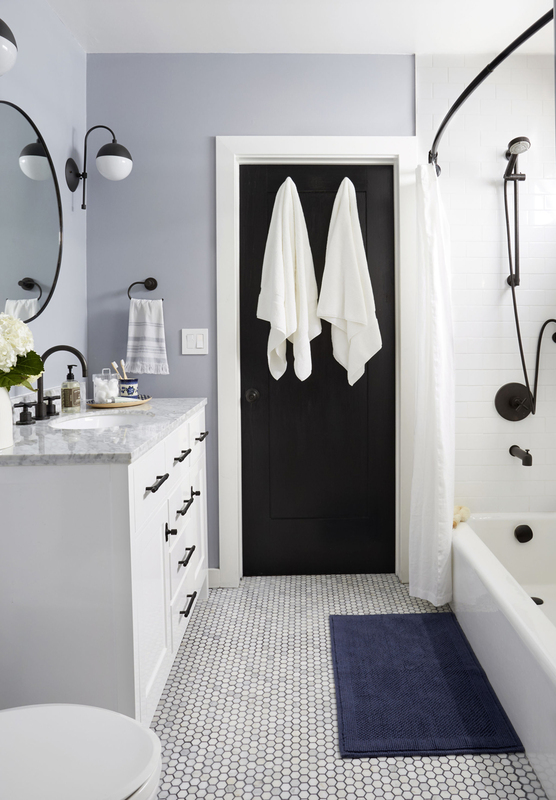 There you have it, a quick, modern, bathroom refresh. Let me know your thoughts or if you have any questions below.